HITACHI KOKUSAI ELECTRIC COMARK - PARALLAX TV TRANSMITTER | 90 Degrees North, Inc. The future has arrived. With rapid changes in solid state RF device technologies and design techniques, combined with our commitment to improve efficiency, Hitachi-COMARK has developed our commitment to improve efficiency , Hitachi-Comark has developed PARALLAX™—the industry’s next generation medium and high power liquid cooled, solid state transmitter. 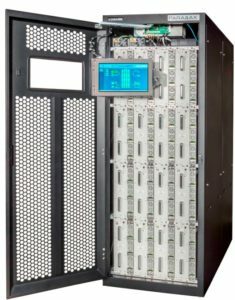 PARALLAX features unique engineering that allows for the highest signal quality, reliability, and efficiency while keeping the cost of ownership as low as possible. Most important, PARALLAX offers flexibility: no matter how large or small, each station is assured top-notch performance for its specific needs. Manufactured, serviced, and supported in the U.S.A.